Dream Hoarders sparked a national conversation on the dangerous separation between the upper middle class and everyone else. Now in paperback and newly updated for the age of Trump, Brookings Institution senior fellow Richard Reeves is continuing to challenge the class system in America. In America, everyone knows that the top 1 percent are the villains. The rest of us, the 99 percent--we are the good guys. Not so, argues Reeves. The real class divide is not between the upper class and the upper middle class: it is between the upper middle class and everyone else. The separation of the upper middle class from everyone else is both economic and social, and the practice of "opportunity hoarding"--gaining exclusive access to scarce resources--is especially prevalent among parents who want to perpetuate privilege to the benefit of their children. While many families believe this is just good parenting, it is actually hurting others by reducing their chances of securing these opportunities. There is a glass floor created for each affluent child helped by his or her wealthy, stable family. That glass floor is a glass ceiling for another child. Throughout Dream Hoarders, Reeves explores the creation and perpetuation of opportunity hoarding, and what should be done to stop it, including controversial solutions such as ending legacy admissions to school. He offers specific steps toward reducing inequality and asks the upper middle class to pay for it. Convinced of their merit, members of the upper middle class believes they are entitled to those tax breaks and hoarded opportunities. After all, they aren't the 1 percent. The national obsession with the super rich allows the upper middle class to convince themselves that they are just like the rest of America. 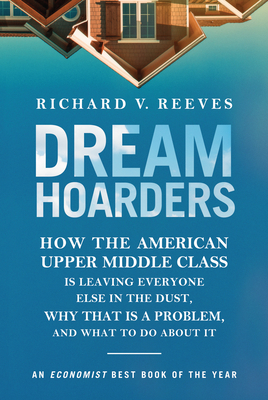 In Dream Hoarders, Reeves argues that in many ways, they are worse, and that changes in policy and social conscience are the only way to fix the broken system. Richard V. Reeves is a senior fellow in Economic Studies and co-director of the Center on Children and Families at the Brookings Institution.